A total of 2,600 homes are approved, with current plans calling for 1,300 single-family homes to be built in the gated Cresswind community. 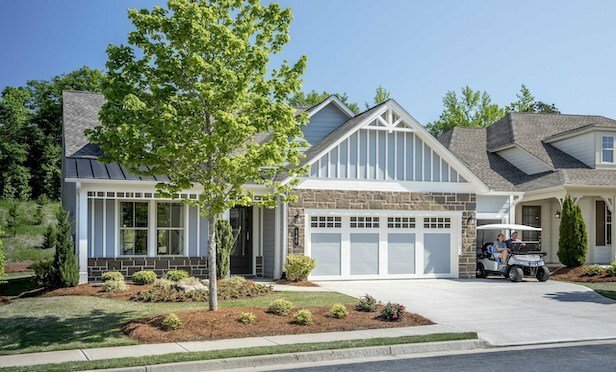 Kolter Homes plans to develop one of its Cresswind 55+ communities at the 1,422-acre master-planned development site in Hoschton, GA.
HOSCHTON, GA—Palm Beach County, FL-based Kolter Homes has acquired 1,422 acres in this Northeast suburb of Atlanta where it intends to build more than 1,300 homes. Kolter officials state land development will begin soon on what the company terms as one of the largest new master-planned community projects in the greater Atlanta metro area. No financial terms of the land purchase or the estimated cost of the 1,300 residence project were disclosed. The Twin Lakes project is bordered by the Mulberry River to the south is located along Highway 53 less than a mile from Hoschton’s downtown district. The master planned community, will be comprised of multiple sections including one of Kolter Homes’ Cresswind 55+ communities. The overall Twin Lakes master-planned development, named after its 11-acre and 39-acre waterways, is located approximately 40 miles northeast of Atlanta. A total of 2,600 homes are approved, with current plans calling for 1,300 single-family homes to be built in the gated Cresswind community. The property’s origins date back to the 1800s and include ownership ties to well-known local philanthropist and retail developer Scott Hudgens who developed several major Atlanta-area shopping centers, including the Mall of Georgia. Hudgens, who passed away in 2000, was also known for his charity work and involvement with the Atlanta Committee for the Olympic Games in preparation for the 1996 games. The age-restricted Cresswind community will include a resident-exclusive clubhouse, an indoor pool, demonstration kitchen, ballroom, fitness center, yoga studio, art & crafts studio, billiards and various social clubs. Planned outdoor amenities across Cresswind’s 940-plus acres include a large pickleball complex, walking trails, outdoor pool, event lawn with amphitheater and tennis and bocce courts. Residents will also be able to fish the property’s two lakes, and details are currently being finalized on boating usage, Kolter Homes states in a press announcement. The Cresswind by Kolter Homes division includes adult communities in Florida, Georgia, North Carolina and South Carolina). Kolter Homes’ Cresswind portfolio currently features seven active properties—Lake Lanier (Gainesville, GA), Victoria Gardens (DeLand, FL), Charleston (Summerville, SC), Charlotte (NC), Myrtle Beach (SC), PGA Village Verano (Port St. Lucie, FL) and Peachtree City (GA) with more communities in development. Kolter Homes is a division of the Kolter Group, a real estate development and investment firm that has invested in projects with expected value in excess of $10 billion. Headquartered in West Palm Beach, FL, Kolter is currently developing in more than 30 locations throughout the Southeast.